Summer is here; a time you will want to take a swim almost anytime so your pool should be clean always. That said, you need to get the best above ground pool cleaner to keep your pool water crystal clear. But then, the market is flooded with not only different models but also types. You will find brands like Hayward, Aquabot, Dolphin, and the rest and a range of types too including suction pool cleaners, pressure pool cleaners, and robotic pool cleaners among others. All these in mind, it may be quite a big problem choosing a pool cleaner for your existing or newly installed above ground pool. 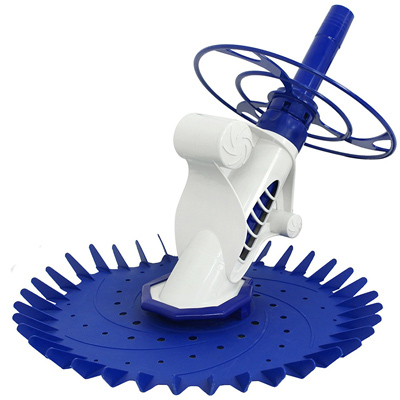 If you are looking for the best above ground pool cleaner, you just came to the right place. We reviewed the top 5 best above-ground pool cleaners, at least from each category and with the budget-buyer in mind too. So, without wasting time, here are our top 5 picks. 8 Is a pool cleaner a worthy purchase? 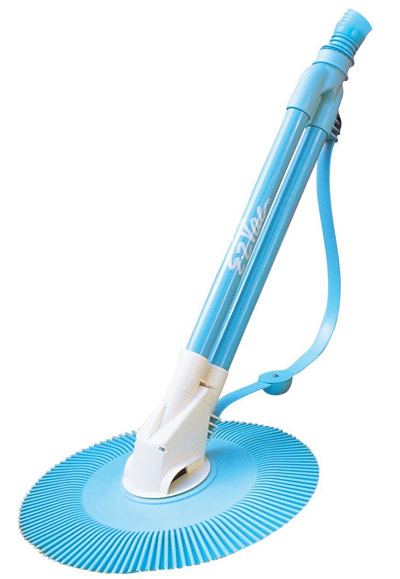 If you want value for money, I recommend this automatic pool cleaner from Intex. It costs less than $100 and will work with small and also large above ground pools. And from the fact that it is automatic, you don’t have to manually clean your pool; it knows how to do its job. I used the Intex 28001E for quite some time before I gave it to my brother for his Intex Easy Set and three years down the line, it still worked fine when I visited. I like it because it is very cheap, only $77 and it puts up quite some great performance on above ground pools. It comes with 4 plastic wheels, and remember, they are not powered – they just move freely by themselves so you don’t have to worry about scratches on your vinyl liner. If you are a handyman with a few DIY skills, it shouldn’t be a problem installing it but note that it works with the return and not the inlet as written on the Amazon product page. Though the manufacturer recommends a less powerful pump, tested it with my 2500 GPH pump and it worked just fine; no signs of straining at all. On the downside, the idea that it will require the pump to be running makes it quite a put off especially if you are keen on saving energy. But then, I don’t think this should be a bother considering it is meant for small pools which means, shorter running times. Another thing, the tires are too small and on a floor with wrinkles, its movement is greatly troubled so before using it, make sure to remove large wrinkles. If you are on a budget and you want the perfect blend of performance and affordability, the Intex 28001E is just the best. This is an automatic pool cleaner that retails at around $70. But then, be aware of the fact that it requires the pump to be on. 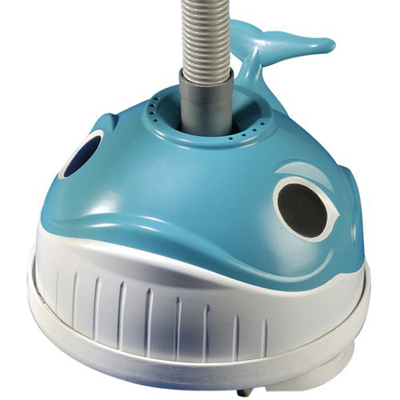 If your pool is very near the house, you want something that won’t wake the baby or create any noise disturbance and Wanda the Whale is your cleaner. It boasts a unique turbine system that cuts down noise operation by up to 25% and with the entire unit enclosed, very little noise comes out of it. It operates at around 45dB and this doesn’t compromise output in any way. What I like most about the Hayward 900 is the precise navigation system – it ensures every area of your pool is touched, but how? Hayward brought on board Santoprene shoes and the revolutionary SmartDrive technology that uses sensors to map the entire pool and plan for a methodical cleaning. Besides this, it ensures that it finishes cleaning within the shortest time possible reason being, the cleaning is patterned as opposed to random. The whale design is also noteworthy and kids will really love it – but remember safety first. Don’t allow kids near the cleaner unsupervised; the suction can be hazardous. Installation is very easy and requires basic joining skills – no tools required at all. Regarding cleaning performance, the Whale does a great job of fairly sized above ground and on ground pools. But then, it runs off your filter system meaning your filters will get overwhelmed and replacement intervals will definitely become shorter. But if you are on a saltwater filter, this is not a concern because sand filters last for up to 5 years. I’d also like to point to the fact that the 32 ft hose may not be enough if you have a large pool, say the Intex Frame Set. Make sure to buy an extra 10 or 20 ft. at a cost of around $20. I like Wanda the Whale courtesy of the friendly design and quiet operation, the performance is good also. But when buying, remember it runs on your filter system so you will be required to service the filter pump twice as much. I know finding time for your normal pool cleaner maintenance is hard. And besides, buying replacement parts is quite costly. If maintenance is your worry, get the Pentair Kreepy Krauley and be rest assured of zero maintenance. It has only one moving part, the flapper so you don’t have to worry about replacing wheels, diaphragm, filters, and other parts. In addition to this, it is quite durable. You will agree with me that your average robotic or pressure side cleaner won’t work on all floors, especially the slopes on a bowl-shaped pool. But the Pentair K50600 will thoroughly clean every corner of your pool – be it the ladder area or the sloping floor. Regarding performance, the Kreepy Krauley is a top player and will vacuum all dirt and debris courtesy of the hydraulic suction mechanism. But then, the much-hyped true random navigation is not anything to rely on if you have a large pool. I agree that this works perfectly for small pools but in large pools, be sure of some spots remaining untouched. If you have a large pool, get something like Wanda the Whale – it has an intelligent navigation system, SmartDrive. On the downside, this is quite a noisy pool cleaner and won’t be a great bargain if your pool is very near the house. It produces around 60dB, something that can be attributed to the fact that the moving part is not enclosed. Besides the noise, it will certainly get stuck when it goes behind the ladder. But if you have those detachable ladders, you might want to remove it when it’s cleaning. Apart from the noisy operation, the Pentair K50600 is a great vacuum cleaner for those who don’t want the hassles of maintenance; both in terms of costs and labor. The initial cost too is affordable. If you are on a very tight budget, here’s a budget cleaner that should top your wish list. It retails at only $70 and offers quite some great cleaning on above ground pools. Besides the low initial cost, it is very cheap to maintain as it comes with very few moving parts. The F2C Automatic Climb boasts a simple and rugged design and one thing I must acknowledge is the solid base plate that ensures maximum adhesion. The seal is very gentle and will not damage the pool’s liner like many of the cleaners out here. The hose is quite long, 33 ft. and has been made from quality PE material making it very durable. The F2C is automatic as the name suggests and will run off the filter system. So, in as much as it’s cheap, the running costs may be higher because the pump needs to be on and second, it overwhelms the filter system by bringing in all the debris which in most times are large debris like pebbles and small twigs. On the downside, it is quite noisy because of the hover suction design. But at least, at 55dB, it’s not as noisy as Pentair Kreepy Krauley. If you are on a budget, F2C will be a superb purchase for you. It is very cheap and will still give you the best in class performance. The only problem is the noisy operation which shouldn’t be much of a bother if you want raw cleaning power. Finally, we came to our best pool cleaner in this review, the PoolRover S2 40 that packs quite some excellent raw power as well as a range of convenience features that make it a cut above the rest. Though made for above and on ground pools, you can also use this cleaner on small in-ground pools and it will still work. But the most important feature is the independent operation; no pumps or filters required. Like earlier said, this pool cleaner has quite a lot of features such that you’d want to compare it with the much cheaper Intex Automatic Pool Cleaner. But this is an example of where the mantra of you get what you pay for manifests itself. PoolRover is bigger in size and performance as it retails almost 4 times the price of Intex 28001E. It comes with much larger wheels and be rest assured, they won’t damage your pool floor and walls now that they are powered. The PoolRover S2 40, being a robot cleaner is powered from the mains thanks to the 40 ft. Cord. It has been built with a powerful 115V motor for propulsion so it will definitely be faster, consequently, cleaning faster than pressure side or suction side cleaners. But then, I know you are worried about your safety and thanks to the GFCI, you can feel safe in the water always. Regarding energy efficiency, I don’t think it should be a concern as it uses 150 Watts, and again, it is independent meaning it doesn’t run off your pool pump or filter like many other above ground cleaners. This means longer life for your pump and filter system. Another noteworthy feature is the two-timer settings – 1-hour shut-off for small pools and 2-hour shut-off for larger pools. But all these come at a hefty price, $300 to be precise. The Aquabot PoolRover S2 40 is a robot vacuum cleaner that packs quite some excellent power and the best features that make pool cleaning not only easier but convenient too. The problem is that it’s quite expensive, but at the end of the day, it’s worth every penny! 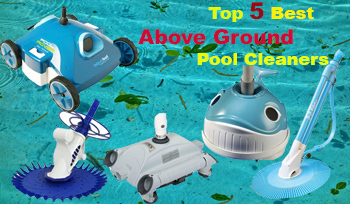 Now that you know a few things about our top 5 picks for the best above ground pool cleaners, it’s time we dig deeper and discuss several important aspects that you need to be well acquainted with when shopping. That said, let’s first look at the types of above ground pools that you will find in the market. Like earlier mentioned, there are several types of above ground pool cleaners to cater for the equally wide range of above ground pool types. In this section, we will try to look at how above ground pools are categorized. If you did your homework you know that the classification of pool cleaners is based on operation mode; automatic vs manual operation. 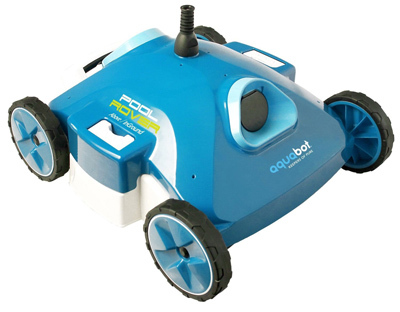 An automatic pool cleaner would do the job by itself and a good example is a robotic pool cleaner like Dolphin Premier, an in-ground pool cleaner. We also have automatic pool cleaners for above ground pools like Intex 28001E or Aquabot Pool Rover Junior which in fact would work perfectly for large above-ground pools like the 15ft.*33in. Intex Easy Set. On the other hand, manual pool cleaners require human intervention and are just like handheld vacuum cleaners. You have to manually push it and direct it where it should scrub. If you have enough time for your pool, then you shouldn’t mind buying a manual pool cleaner. But then, what is the best pool cleaner type between the two? This is a personal decision and there are a lot of factors that need to be considered before declaring any of them the best. But a few things I want you to know. First, manual pool cleaners are cheaper both in terms of initial costs and maintenance – the fewer parts explain this. But then, they are not convenient because you have to be there pushing it manually. This can be strenuous especially if you have a large pool or you live in an area with many trees around. Second, automatic pool cleaners are expensive but their convenience is worth every penny. As the name suggests, they work independently so you might be away and the cleaner is working. In fact, some high-end robotic models can be controlled from your Smartphone as they have a wireless connection – a good example of a Smart robotic pool cleaner is the Maytronics M500 – an in-ground pool cleaner. In the market, you will also stumble upon three types of automatic pool cleaners. So, it will be important to have at least a little basic information about them. 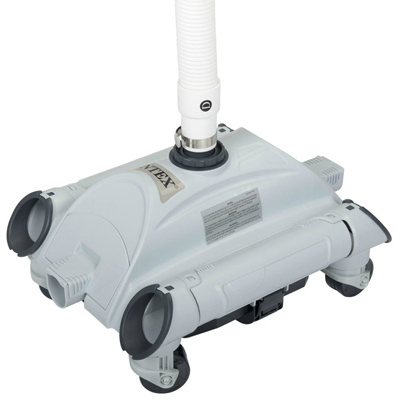 Suction pool cleaners – Also known as suction-side pool cleaners are the simplest because they connect to the filter system’s water intake and use the pump’s suction to collect all dirt and debris from the pool water. A good example of suction-side pool cleaner is the Barracuda G3. Though they are cheaper, the fact that they require the pump to be operational when it’s working makes it energy inefficient. Also, it overwhelms the filter system for no good reason. Pressure pool cleaners – These cleaners are also known as pressure side cleaners. They are hooked to the return valves of your pool to take advantage of the water pressure in order to propel themselves. One thing to note here is that these cleaners are very efficient as they don’t require electricity. They retail between $200 and $900 depending on the brand and also, the features. The most popular suction side cleaners for above ground pools are Pentair Kreepy Krauley and Hayward 900. Robotic pool cleaners – As the name suggests, these cleaners have been engineered with robotics technology enable them to operate autonomously. For the record, automatic cleaners are not necessarily robotic cleaners but for sure, a robotic cleaner in an automatic cleaner. But what makes robotic cleaners different? The distinguishing factor is the autonomy of the robotic cleaner especially when it comes to navigation. These ones intelligently navigate around the pool using dedicated sensors and microprocessors – the same way Roombas do. Their advantage is the convenience – you can schedule them and forget about pool cleaning and also, they are the most effective. Examples include Aquabot Elite, Maytronics M500, and 2018 Dolphin Premier for in-ground pools and for above ground pools, examples include the Hayward SharkVac and Aquabot X-Large Breeze. You will agree with me that buying a pool cleaner may not be an easy task especially if you are buying for the first time. This is because you don’t know exactly what to buy and that’s why we decided to discuss this matter in detail. In this segment, we have highlighted the important factors you need to consider before settling for any above ground pool cleaner. Budget – The first thing you should do is to set your budget before starting to shop around. I’m sure you have listed out all your requirements and set a range that fits your budget, do this for the cleaner too. I ‘m saying this is the first step because your budget determines a lot of things; the brand, type of pool cleaner, features and so on. But then, never feel like you are tied from stretching a little bit – a few extra bucks could get you that awesome feature you’re envying. Brand – Though most people disregard this, the brand you are buying from really matters. I always recommend buying from the top brands like Hayward, Intex, Dolphin, Zodiac and the rest. This is for two reasons; first, you are guaranteed top performance and durability and second, top brands have excellent after sales – they don’t risk their reputation. But then, know that top brands are quite expensive but at the end of the day, they offer real value for money. Pool size – This is also another important and basic consideration because pool cleaners don’t just work with all pool sizes. If you have a small pool a small cleaner will do the job and you can even opt for the much cheaper manual cleaners. But if it’s big, you will need an automatic cleaner, preferably a robot cleaner that will be working autonomously and one that is powerful enough to scrub the large floors. Cleaning performance – This is the most critical consideration as it is the primary reason why you’re buying the cleaner. When addressing cleaning performance, there are several aspects that need to be put in the picture. First, ascertain the cleaning orientation. Besides floor cleaning, does it scrub walls? What about steps? Make sure to pick a cleaner that is versatile and will even cover your future above ground cleaning needs. You should also check the filters and brushes. They should be designed to handle the toughest jobs. But then, how do you know a pool cleaner is effective or not yet you haven’t used it? I know this is a bother but with the many verified customer reviews as well as expert reviews and opinion, you should be able to judge a pool cleaner. Corded vs. cordless – In the market, you will find two types of pool cleaners, corded and cordless. Make a distinction between the advantages of the two types. For starters, you may choose a corded cleaner if your pool is small but if it’s large, a cordless cleaner will be the bets – it doesn’t limit the cleaner’s reach. Bag vs. bagless – Above ground pool cleaners may come with a bag or without one. If you are comfortable buying replacement bags (disposables), then get a bagless cleaner. But if you don’t want to spend much on maintenance, get a cleaner with a bag. Warranty – Though it’s not a wish that your pool cleaner breaks down, it is important to consider the warranty of any pool cleaner, especially automatic pool cleaners. With the warranty, you can at least have a damaged pool cleaner replaced or repaired if it is still under the warranty terms. Make sure to buy a pool cleaner with the longest warranty for maximum protection. But then, reading and understanding the terms is the most important things. Go through it carefully and ascertain the parts that are covered by the warranty and those that aren’t. Also, adhere to all the instructions provided, especially installation instructions lest you void the warranty unknowingly. Is a pool cleaner a worthy purchase? I know the extra cost of a pool cleaner is such a pain but then, it’s the only way to enjoy the hot summers uninterrupted. But still, you’d want to ask, are there any benefits of having a pool cleaner other than keeping pool water clean. The first thing you should consider here is your family’s health. Research shows that a lot of Recreational Water Illnesses are avoidable when you have a pool cleaner. But with a pool cleaner and regular pool cleaning, there is little chance for algae, bacteria, and fungus to develop. That said, a pool cleaner is a priority if your family’s health matters. Besides family health, a pool cleaner will make your pool and pool installations last longer. As you all know, pool dirt is a leading cause of wear on pools and once you keep dirt at bay, you are sure of more years with your pool pump and even the pool itself. Another thing, it is cheaper to operate a personal pool cleaner than hiring a pool cleaning company. The average cost of hiring a pool cleaning company for an average residential pool is $100. If you call them three times in a month, that’s $300, the cost of a good automatic pool cleaner. If you want to buy a pool cleaner, you can opt to buy in online or in a local store nearby. Each of these two options has advantages and disadvantages. When it comes to offline stores, you get the exclusive advantage of viewing the product first hand. You can see it physically and may lift it. You also get to ask lots of information and the feedback is immediate. Unfortunately, there is no variety like in online stores. On the other hand, buying online is stress-free. You just buy the pump and it will be delivered to you. Besides the convenience, you get to choose from a wide variety so your options are not limited. But the best advantage of buying online is that you get the best prices. There is no monopoly like your local swimming pool shop. More than often, you will get pool cleaners at great discounts because the many sellers are always competing and the price is a key determinant in e-commerce. Now, we have come to the end of our review and in summary, we have seen that a pool; cleaner is an important equipment for pool owners. It is the easiest and most effective way to keep your pool clean. But then, it’s imperative that you get the right tool for the right job so make sure the cleaner you buy fits your cleaning needs both in terms of the pool type and size and as well as the common dirt.